With smartphone adoption rates poised to reach 76% by 2020, Malaysia’s banks and fintech companies are standing toe-to-toe with each other to roll out the next best digital solution. As discussed at the Asian Banking & Finance Retail Banking Forum in Kuala Lumpur, the country’s internet penetration rate of 79% remains the highest in Southeast Asia, making it a very attractive space for local and foreign digital giants. Like many others across the globe, mobile is Malaysia’s first point of internet connection. However, analysts observe that Malaysian mobile users have even closer similarities to Chinese consumers in terms of behaviour, making Chinese brands and products even more appealing to them. The Chinese invasion is indeed aggressive in the Malaysian market, as evidenced by Alibaba’s first Southeast Asian office launched at the Digital Free Trade Zone (DFTZ) in Kuala Lumpur. Jasmine Ng, head of strategic digital alliances at Maybank, said Southeast Asia is a key battleground for Chinese tech giants, with Malaysia, Thailand, the Philippines, and Indonesia ranked as the top four countries in the region. Ng said the digital dragons are coming out of China to reach wider aspects of customers’ lifestyles, diversify revenue streams, serve increasing outbound Chinese tourists, and penetrate new markets by international investment, as a strategy for future growth amidst saturation in the domestic market. China’s key investments in Malaysia include Alibaba’s launch of Alitrip Malaysia Tourism Pavilion and Tencent’s 15% stake at Patimas Computer, a leading IT service provider in the country. Banks and fintech companies are also being challenged to step up not only to huge foreign companies, but also to changing demographic compositions and preferences. Amongst these trends, banks and fintechs are seeing greater demand to cater to emerging segments of the Malaysian market. Aizuddin Danian, head of digital banking at Standard Chartered Bank, said that Malaysia is seeing the rise of the emerging affluent, young professionals, and business owners whose upward income trajectories collectively contribute significantly to their nation’s GDP. According to him, the emerging affluent are ambitious, highly confident, optimistic, and crave accessibility. To capture this highly significant demographic, banks must be able to go with them anytime, anywhere because they crave convenience and the ability to access their wealth wherever and whenever they wish. Danian said that the bank that the emerging affluent will have the closest affinity with will be the bank who does the basics the best: bills payment, fund transfers, check balances, check transactions, overseas remittances, and changes in personal information. But whilst the emerging affluent are tech-savvy, they also put importance on the human touch. “The emerging affluent understand that a digital bank is a machine, a piece of technology, online-only. But being humans, they will sometimes look for human interaction to answer more complex needs,” Danian added. In order to address these complex needs, banks must be able to declutter the digital banking experience and deliver flawlessly. Danian said that the emerging affluent need advice on how to save, where to invest, what their portfolio looks like, and how it is performing at the moment. Lastly, the emerging affluent demand superb wealth management. Danian said Standard Chartered has been able to provide online unit trusts, investment profiles (CIP), market commentary emails and alerts, and premium Click2Chat to its diverse clientele. He noted that banks must grab digital as an opportunity to make information available in the convenience of a smartphone. “Do we need to rethink our source of competitive advantage and new revenue streams? Can we reimagine customers’ assets as channel partners for our retail banking business? Should we shift our thinking from building Big Data to being in places where there is client attention? How should we reimagine ‘work’, ‘worker’, and ‘workplace’ of the future? 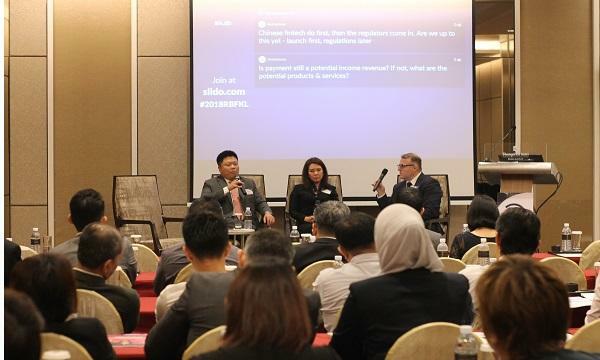 How should we prepare as a business for more of PSD2 themed regulations coming in?” asked Arnub Ghosh, director, strategy consulting at Monitor Deloitte, Southeast Asia. Ghosh added that asset-heavy companies are beginning to move into services, as the percentage of fixed assets owned by companies continue to go down by 7%-8% each year. With all of these changes and challenges coming in, Ghosh said that the entire region must be able to answer the question of whether it is ready to adjust and step up. When JP Morgan Chase and OnDeck partnered up to build Chase Business Quick Capital, the bank + fintech collaboration enabled small businesses to access up to $200,000 in loans for up to 24 months. Nisha Paramjothi, director, head, Ecosystem Partnerships and JVs, CIMB Investment Bank, said that this was a win-win partnership, with clients having their applications processed within minutes and receiving decisions in seconds and disbursements in one day. According to Paramjothi, the role of banks is to serve as collaborator, mentor, and investor. She said that banks must be able to build a facilitative environment where there is an integration layer for internal, external, and partner APIs. Banks should also ensure a conducive, non-destructive sandbox for experiments and enhanced security for data. To get experiments right, Paramjothi said that banks must have established a business case or customer need, agile development or roll outs with streamlined processes, and they must be embedded in banks’ existing businesses. CIMB had a promising start she said, with partnerships with Grab, Gojek, and AliPay. The bank has also onboarded fintechs like ActiveAI, MoneyThor, KataAI, Sleekr, and Bambu. At present, however, the current way of banking is still full of friction. Whilst there may be several channels through which clients can do business, these channels work in silos and thereby, engagement is still disconnected. Many banks have not been careful with their technology investments and rollouts, reinforcing current systems and processes that do not cater for timely innovations. Additionally, changes have been very costly to implement and data collection has been disparate with analyses usually out of date. Nevertheless, Paramjothi said that the future of banking still holds much promise. Clients can expect banks and fintechs to develop seamless bank-customer engagement through efficient frictionless human-technology interaction. Banks are also moving into better ease of integration or collaboration with other internal and external systems, resulting in frictionless back office integration. Malaysia’s banks should keep in mind the essential elements of future banking, if they want to succeed amidst the speedily evolving digital landscape. These elements are scenario-based invention, anytime anywhere banking, digital at the core, customer-centric approach, and big data analytics.